Student’s dog crate nabs design scholarship. PORTLAND, ORE. (Sept. 14, 11:40 a.m. ET) — The Society of Plastics Engineers’ Thermoforming Division has been placing thermoforming equipment at design schools for the past few years to encourage future product developers to learn more about the process. Now thermoformer Freetech Plastics Inc. has increased the incentive to use the equipment with a scholarship competition for design students across North America who mold and create their own concepts using that equipment. “Since [thermoforming] is not taught much in schools, it’s an opportunity to get the word out,” President Rich Freeman said during an Aug. 6 interview at the Industrial Designers Society of America annual international conference in Portland. Fremont, Calif.-based Freetech showed off the three finalists in the competition and asked attendees to cast votes for the winner. They chose a concept dog crate by Carianne Seger, a senior at San Jose State University in California. The cage is intended to look more like a piece of furniture with its oval shape, fitting more easily into someone’s home than a standard cage. It can even double as a stool or table. Seger will receive $2,000 for the design. Brian Au, another San Jose design student, received $1,250 for second place for its sculpted bud vase and Steve Lan took third for his car-top carrier. The rules require each student to make his or her own mold, and mold a concept version using thermoforming equipment. 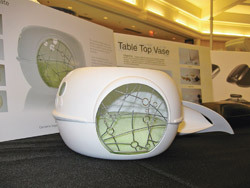 Judging was based on the creativity of the design and the difficulty of thermoforming the final product. Seger had visited Freetech previously as part of a materials and processes class, but the competition gave her a reason to spend more time with thermoforming. The prize will be open to design students again in advance of next year’s IDSA meeting, with rules available at freetechplastics.com.